HERSHEY, PA — The Hershey Bears have one game remaining in the regular season. In their second to last game, the Bears took down the Utica Comets 4-1. Jayson Megna picked up his 20th goal of the season, and for assist markers, Mike Sgarbossa tallied his 35th and Aaron Ness hit his 50th helper tonight – a career high for both players. After tonight’s win, the Bears announced the playoff schedule for their first round matchup against the Bridgeport Sound Tigers. The best-of-five series will start with two games in Bridgeport and have Game 3 and 4 (if needed) in Hershey (see the full schedule here). The Chocolate and White will look to sweep the regular season matchups against the Harford Wolf Pack on Sunday. Their final game of the season will be Fan Appreciation Night and some lucky fans will go home with jerseys right from their favorite players. It should be a good night before the playoffs kick off. For more on tonight’s matchup, check out our full-game recap and keep scrolling for some photos from the game. Caps’ fan Greg Christian was on a mission to see every NHL arena with his wife, and earlier this year he completed it with a photo of her after she lost her battle with cancer. Tonight he made his way to Chocolate Town. Read more about Greg and Dona’s story. Chris McCarthy joins the Hershey Bears after the Reading Royals’ season ended. Adam Morrison is in Hershey with Samsonov recalled to Washington. The Caps signed Notre Dame defender Bobby Nardella and now he’s in Hershey on an ATO. Walker always pesting the goalies. Lots of fan support on the goalie post – Go Bears! Gotta get the smelling salts. The boys celebrate a goal from Gersich. After a scrum, Darcy wouldn’t leave Sgarbossa alone and DSP stepped in. And we get the win. After every win, it’s essential to pick up Walker. I love DSP laughing in the background. 20 goals in a season. Not too shabby. 31 saves and it’s time for his First-Star-of-the-Game interview! 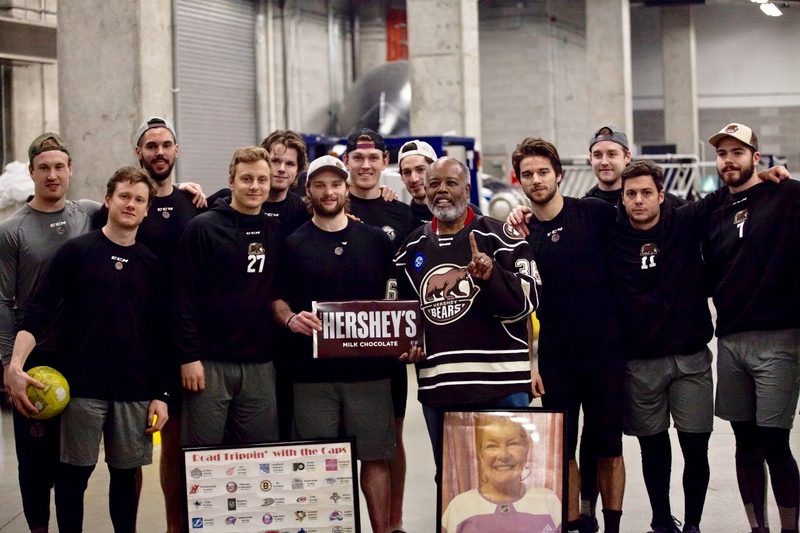 This entry was posted in Hershey Bears and tagged Aaron Ness, Adam Morrison, Beck Malenstyn, Bobby Nardella, Chris McCarthy, Connor Hobbs, Devante Smith-Pelly, Hershey Bears, Jayson Megna, Nathan Walker, Shane Gerisch, Tori Hartman, Utica Comets, Vitek Vanecek, Washington Capitals Prospects. Bookmark the permalink.